Underground coal mines experience a major hazard during seismic events because coal dust naturally present in the mine is disturbed and suspended in the air. In the event of an explosion, the coal / air mix acts as a conduit for the explosive flame to travel along the mine tunnels. To reduce the formation of the coal / air mix and inhibit flame propagation, most coal mine operations apply stone dust particles, such as calcium carbonate powder, to walls in a dry process. Any explosion shock waves disturb the applied calcium carbonate and cause a mixture of coal and calcium carbonate dust to be suspended in the air. Heat from the flame propagation of the explosion is absorbed by the suspended stone dust and quenches the flame. One of the major limitations of current dry stone dusting process used in underground coal mines is the interruption to production necessitated by the requirement to apply the stone dust particles to intake airways. Typically, stone dust particles are applied by some means of blowing the dust onto the roadway surfaces, which leads to the generation of large quantities of fugitive dust and contamination of the downstream airflow. 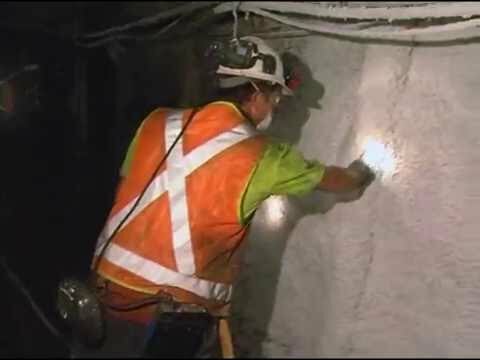 This contamination requires that personnel are removed from inbye of the stone dusting position, and stone dusting of intake roadways can only be done when there is a significant break in mining production. The closure of a mine is costly in terms of lost production time. Attempts have been made to address these shortcomings with the development in the last decade of wet stone dusting. In wet dusting, dry stone dust particles are mixed with a quantity of water in an agitator, and the resulting slurry sprayed on to the coal mine surfaces. The wet method eliminates the problem of contamination of the airflow but brings with it a new problem: as the water-stone dust slurry dries out on the mine surfaces it hardens to form a caked layer, not a friable powder coating. This caked layer compromises the dispersal characteristics of the stone dust particles and therefore their ability to quench and suppress a coal dust explosion. It is believed that subsequent roadway coal dust deposits could be lifted in an explosion without disturbance of the caked stone dust particles, negating the intended effect of the stone dusting. As a result of these concerns, the use of wet stone dusting processes is restricted in many countries. In some countries, wet stone dust cannot be applied without augmentation by conventional dry stone dusting or regular re-applications of the wet stone dust. Accordingly, many coal mines are currently operating using the dry dusting process, which has the associated disadvantages discussed above. The treatment of an aqueous slurry of stone dust particles with Airo-Dust® Additive, a cationic / zwitterionic surfactant blend in water, is used to apply the stone dust slurry as a foam that, when dry, forms a friable dust coating that shows a decreased tendency to caking, unlike the caking that occurs with traditional water / stone dust slurry. The friable coating resulting from the Airo-Dust® process can be disturbed and carried into the air. Accordingly, the suspended stone dust particles are able to inhibit flame propagation. The key benefit to all underground coal mines is in the ability to work inbye whilst continuing to stone dust. A patent covering the Airo-Dust® process has been approved in Australia under the Patent No. 2009326839. This process was introduced into the Australian underground coal market in 2015.